This is another method to removing the deformations of the membrane of single deck floating roof. This method can be used together with stiffening girders in order to assure complementary stability of the roof. When the additional pontoon in the center of the roof is mounted it is necessary to take into consideration the increased sink of the floating roof. This method can be applied only when the roof is able to carry the complementary weight of the pontoons. The new steel bodies are empty. 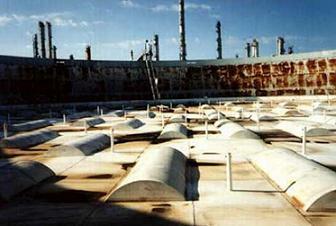 Then they are formed as pontoons, which assure the additive possibility for floating of the roof. In order to assure the necessary weight these additive constructions can be made with thick plates. - the complementary pontoons enable the roof to float in case of punctured membrane or when the drain does not functions properly. - the number of the welding joints is smaller in comparison with the stiffening girders. - the loading of the pontoons is even upon the whole membrane which does not allow the swelling of the liquid steam as a balloon. - the consumption of the metal is increased compared to one pontoon in the center of the membrane. On the point of view of the exploitation this solution is good, and the deviation of the membrane from its project shape are decreased.